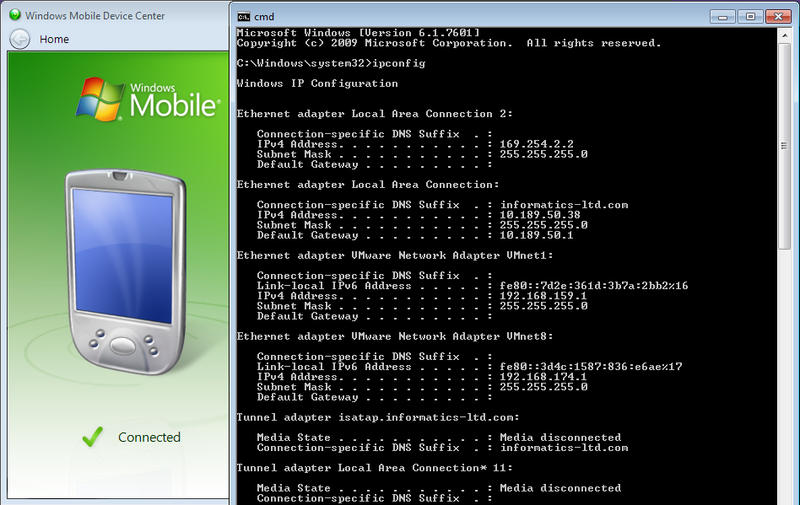 Windows Mobile Device Center creates a virtual network connection when a Windows Mobile/CE device is plugged into a PC. MobileAsset v7 requires a network connection for Windows Mobile/CE devices to sync their data. MobileAsset's Standard edition requires syncing over a data cable. Also, some Professional and Enterprise edition customers require cable syncing due to security concerns. In these cases, MobileAsset uses this virtual network connection. Below are ports and programs that need to be allowed by the network security infrastructure for proper Windows Mobile Device Center/ActiveSync operation. Some articles mention opening just 990 and 5679 is sufficient to allow connection. When the device is connected to the PC, WMDC should create the IP address 169.254.2.2 on the PC (screenshot), and 169.254.2.1 on the device. The PC and the device should be able to ping each other with these addresses. If this network configuration is not being created, then MobileAsset will not be able to sync over the cable. The customer will need to configure their security settings to allow this connection. ActiveSync Desktop Pass-through (DTPT) is a technology that enables a Windows Embedded device to transparently access external networks, such as the Internet, through the desktop computer to which it is connected. DTPT also supports name service-provider service. When a Winsock application that is running on the device makes a request for name resolution, the DTPT Client intercepts the call and forwards it to the DTPT Server for processing. The DTPT Server receives the NSP message and retrieves the requested service information and returns it to the DTPT Client.